Substitute Zavon Hines scored an injury-time winner against 10-man Aston Villa to lift the struggling Hammers out of the bottom three of the Barclays Premier League. Hines fired home after a fine run by Scott Parker as the game looked to be heading for a draw. Mark Noble had put the struggling home side in front from the penalty spot in first-half injury time. England goalkeeper Robert Green then saved Ashley Young's 49th minute spot-kick before the Villa winger atoned for his error with a curling 25-yard equaliser two minutes later. The win lifted the home side out of the relegation zone and into 16th place while Villa, who had Habib Beye sent off late on, remained seventh. West Ham suffered an early injury blow when Herita Ilunga was forced out of the action in the sixth minute. He was replaced by Jonathan Spector. West Ham started brighter than their visitors but despite their early possession, failed to take advantage. Scott Parker tested Brad Friedel in the 11th minute with a 25-yard drive but the American goalkeeper was equal to the task and gathered safely. Green was alert enough to deal with a header from John Carew in the 17th minute but Villa were now beginning to exert some real pressure on the home defence. Green pulled off a magnificent save seconds later when West Ham half cleared a corner and Stiliyan Petrov volleyed the ball towards goal from fully 30 yards. The ball took a deflection on its way towards the top corner but somehow Green managed to get his fingertips in the way. In the 22nd minute Villa's Gabriel Agbonlahor brought another fine save from Green when he let fly with an angled drive from the left side of the penalty area. Villa were now in the ascendancy and a cross from the lively Young was headed over the bar at the near post by Agbonlahor. It got worse for the Hammers in the 31st minute when England international Carlton Cole collected an injury and had to be replaced by Zavon Hines. In the 38th minute Green had to be at his best again to keep out Carew. Villa's build-up was incisive as Emile Heskey dropped the ball on to Carew's feet on the edge of the six-yard box. The Villa striker turned to get his shot away but found Green alert to the danger at the near post. But West Ham were given a penalty in first-half injury time when Beye brought down Hines. Beye was booked and Noble sent his spot-kick into the roof of the net to give the home side the lead against the run of play. Villa replaced Emile Heskey with former West Ham midfielder Nigel Reo-Coker at half-time. Reo-Coker's appearance was met with the expected derision from the Upton Park faithful. In the 49th minute referee Steve Bennett was at the centre of controversy when he awarded Villa penalty. Manuel Da Costa appeared to have headed the ball clear but Bennett clearly thought his feet had come into contact with James Collins. None of the other Villa players appealed for the spot-kick but Bennett waved away West Ham's furious appeals. But justice was seen to be done for the home side when Young's penalty was superbly kept out by Green. The England goalkeeper dived low to his left to parry it to safety to the delight of home fans. But their euphoria was shortlived when Young atoned for his penalty miss with a superb equaliser in the 51st minute. There seemed little danger to the home defence when Young collected the ball on the left flank midway in the West Ham half. But the Villa winger sent a curling shot over the head of Green and into the top corner to put the visitors on level terms. Hines was the most impressive striker in the West Ham ranks and he went close in the 72nd minute with an angled drive that flew just over the bar. An angled drive from Hines brought a fine save from Friedel in the 80th minute as the home side pressed for a winner. Beye was then sent off in the 84th minute for a second bookable offence, a foul on Spector, to leave Villa down to 10 men for the remainder of the game. Green made a superb save to deny Villa a winner in injury time when he turned a 20-yard drive from Young around the post. 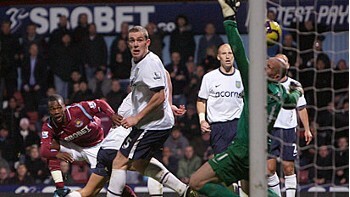 But it was West Ham who grabbed the decider when Hines fired Parker's pass into the roof of the net. West Ham Green, Behrami, Upson, Faubert, Ilunga (Spector 8), Da Costa, Parker, Noble, Collison, Franco (Jimenez 88), Cole (Hines 32). Subs Not Used: Kurucz, Tomkins, Diamanti, Stanislas. Goals: Noble 45 pen, Hines 90. Aston Villa Friedel, Beye, Dunne, Collins, Warnock, Agbonlahor, Petrov, Sidwell, Ashley Young, Heskey (Reo-Coker 46), Carew (Luke Young 86). Subs Not Used: Guzan, Albrighton, Delfouneso, Delph, Shorey. Booked: Beye, Collins, Ashley Young, Petrov.